Rautavaara is an expansive composer (...) The sheer beauty of his sound, of course, explains why these recordings were runaway sucesses when first released: there is not an ugly bar here. Rautavaara weist, das zeigt diese empfehlenswerte Sinfonien-Zusammenstellung, einen Weg, der alte Formen mit frischen Gedanken zu füllen weiß. Dafür gilt dem Achtzigjährigen Hochachtung. With some 30 Rautavaara entries in the Ondine catalogue the composer has been done considerable justice by this gifted label. He must survey it with great pleasure - he certainly deserves to. This set provides a sure route to appreciate one of the grand voices of the last century. He speaks with eloquence and with the engaged rasp and embrace of originality. The music is lambent and Rautavaara's creative journey leads from dissonance to lyrical awe. Loin des querelles d'écoles et jalousies de chapelle, ces huit symphonies forment un tout qui prend sa place dans l'Histoire de la musique. A prix réduit, c'est évidement une belle affaire ! You can purchase this set with complete confidence (...). All of the performances are very good to excellent, and so is the engineering. Go for it. This box of the transcendent composer's symphonies - easily one of the year's most important releases of classical music written in our time. Einojuhani Rautavaara may well be the most popular symphonist alive today. To celebrate his 80th birthday in 2008-2009, Ondine pays homage to its longtime house composer with the first-ever complete release of his eight symphonies in a 4-CD box set. Rautavaara is recognized as one of the most notable Finnish composers after Jean Sibelius. He has often described symphonic music as "a journey through human life." 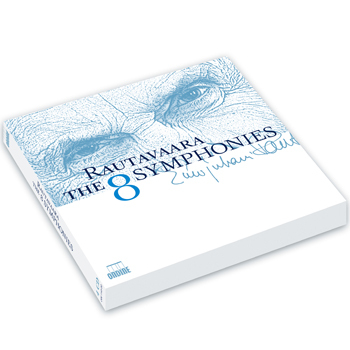 Written between 1955 and 1999, the eight symphonies form a central pillar in Rautavaara's extensive artistic output and showcase the many stylistic periods in his fruitful career. They are hauntingly accessible to the listener and have proven wide audience appeal; the Seventh Symphony, "Angel of Light" (1994), became a best-seller and spurred Rautavaara to considerable international fame (including a GRAMMY nomination; ODE 869-2), leading The Philadelphia Orchestra to commission the Eighth Symphony, "The Journey" (1999), for their centenary celebrations. Leif Segerstam conducting the Helsinki Philharmonic Orchestra (No. 7 & 8; ODE 869-2 and ODE 978-2).